Your weekly PSN update, as promised! Not a lot to boast about in J-RPG land this week, with one new game and unrelated DLC only. But if you're into localised, Japanese Idol games, go play the new Neptunia game! 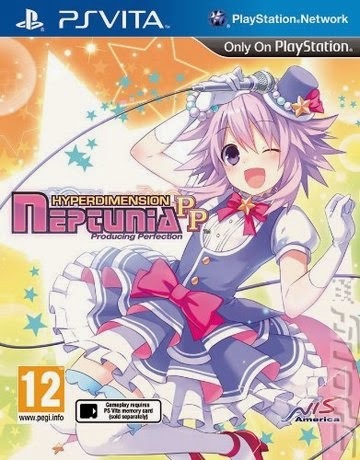 Hyperdimension Neptunia: Producing Perfection: Ooooh, I'm so jealous of anyone who buys this one! The CPUs of Hyperdimension Neptunia's stocks fall due to an 'Idol boom' so the girls decide to join in on the musical fun. Your job is to produce them by polishing their performance skills and keep them from becoming stressed so that they become the best Idols and their stocks boom. This game isn't for everyone - you only have to google the game's reviews to see that. If you're a fan of the Neptunia games or Idol simulator games, I think this is for you. It's a fun idea that isn't meant to be taken too seriously, sounds like it will fit well as a portable game and I can't wait to play it. All of the new PSN content can be found at the European Playstation Network Store. If physical copies are more your thing, Play-Asia and Amazon definitely have the new Neptunia game.